Hi All! We have our monthly staff meeting at work tomorrow morning (by morning I mean the incredibly early 7am- it should be illegal!) and, in my infinite wisdom, I offered to make a set of cards to be raffled off. Normally this is really no big deal but with all the Christmas card orders, and other misc orders I'm falling behind on, it was probably not my best idea ever! 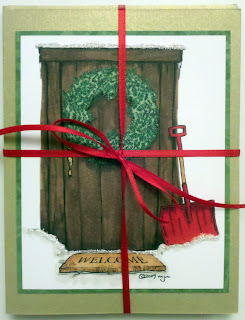 But, luckily, I had a delightful new digital stamp from Mo Manning at http://digitalpenciltoo.com aptly named 'Door with Wreath' that was just the thing to make a simple but pretty card. 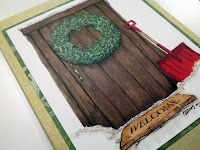 I had some Little Yellow Bicycle patterned paper that's green with embossed snowflakes from a year or two ago and it was the perfect thing to mat the stamped image, which I'd colored with my Copics, to make the wreath pop. I added some Stickles in Frosted Lace for a little accent of snow as a finishing touch. Once the cards were done I just used a simple ribbon to tie it all together and I think it's a nice little set. 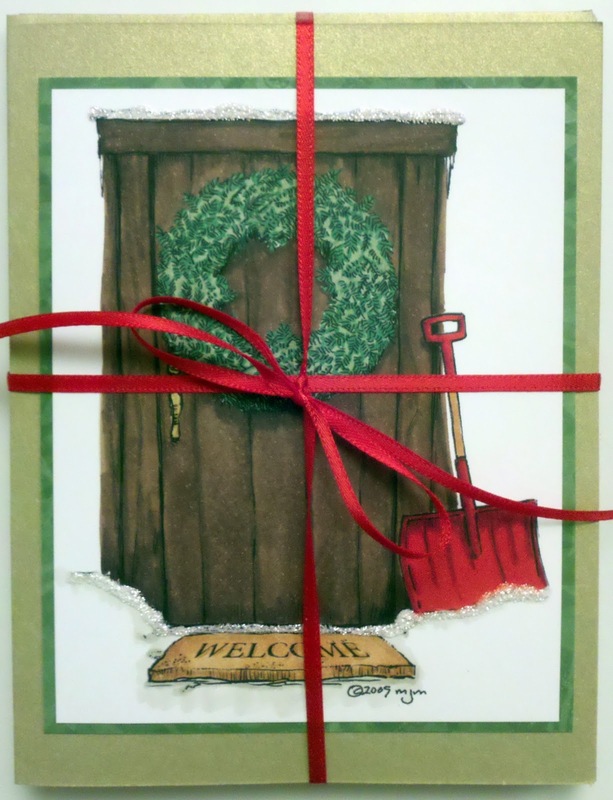 I'm so in love with how the image turned out I think I might have to make a few more cards for myself to write my thank you's after the holidays!